When the sun goes down, it’s your turn to light up the pitch. Become a Nite Crawler with the stunning new boot pack from adidas, as their most popular silos switch into full-on stealth-mode. The ability to become invisible and find those little pockets of space is something that every football player dreams of. The best players on the planet are trained to read the game, slip through the shadows and escape the opposition. It’s all about losing your marker, confusing the defence and ultimately popping up in the right place at the right time. Such qualities will earmark you as one of the best players on the pitch. But it’s never as easy as it sounds. Swift movement, agile changes of direction and cheeky feints are all effective ways of getting yourself that extra yard of space, but the opposition will be doing everything in their power to stop you. Only a select few- such as David Silva and Andres Iniesta- can claim that they’re true masters of finding space on the football pitch. Fortunately, adidas have just unleashed a stunning new colourway that aims to help you achieve full-on stealth-mode. 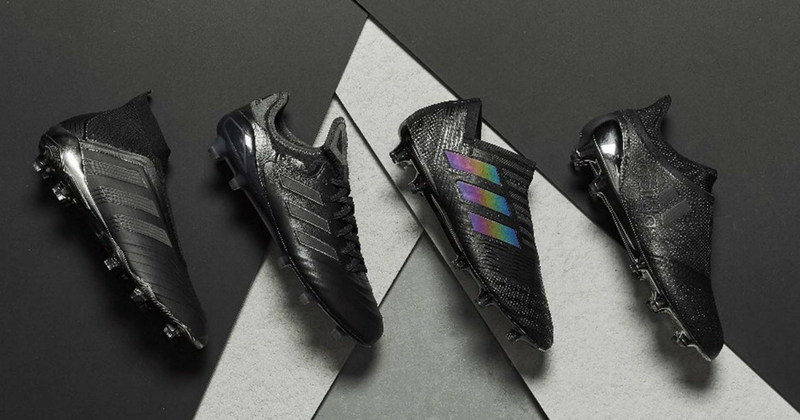 Making stealth a whole lot stealthier, the adidas ‘Nite Crawler’ pack encourages players to move through the shadows and make the most of their creativity. The ‘Nite Crawler’ pack implements a slick black colourway, offering a much smarter design than their past few boot pack releases. While the new collection might not be as vibrant or colourful as the ‘Cold Blooded’ pack, the ‘Nite Crawler’ designs more than make up for it with a certain sense of exuberant style. Adidas have given new make-overs to some of their most popular silos- with the Nemeziz, X, Copa and Predator all receiving a fresh look. All four of these designs make use of an all-black colourway, with tiny dashes of colour added to some of the detailing. The ‘Nite Crawler’ Nemeziz implements hi-res shades of green on the iconic Three Stripes, while the new Predator offers red lining and a gorgeous chrome soleplate. But if you’re looking for a complete blackout-look that would make even Batman feel proud, then the Copa and X are certainly worth your attention. In terms of the boot technology, the ‘Nite Crawler’ pack implements exactly the same constructions as the ‘Cold Blooded’ and ‘Lone Hunter’ packs. By making use of the most innovative boot tech at adidas’ disposal, these boots don’t only help you move through the shadows, they also give you everything you need to steal the spotlight. We’ve already seen the likes of Mohamed Salah, Luis Suarez, Paul Pogba and Angel Di Maria showing off the new ‘Nite Crawler’ pack, and we expect to see many more players to follow suit this weekend. In fact, with two of the Nemeziz poster-boys facing off this weekend in Jesse Lingard and Roberto Firmino, we’ll be hoping to see the new ‘Nite Crawler’ designs at Old Trafford on Saturday! What do you think of the new designs? Are you a big fan of this smarter colourway, or do you prefer something a little more extravagant? Let us know in the comments! FOOTY.COM will be bringing you the best deals on the new ‘Nite Crawler’ pack soon, along with all of your other favourite adidas football boots! Compare prices with us today and seize the spotlight at the best price possible.